At the height of the First World War, thousands of women, engineering and shipyard workers descended on Glasgow Sheriff Court and the City Chambers to protest the fate of eighteen tenants who had been taken to court for non-payment of rent. The protest was led by a woman, Mary Barbour. As a result of the ships and munitions needed for the war effort, thousands of workers flocked to Glasgow’s shipyards and munitions factories. Since demand for rental property outstripped supply landlords calculated they could raise rents. With demand for accommodation so high landlords were unconcerned about the ability of sitting tenants to pay the increase and with so many men away fighting they thought the women in the flats would be reluctant to object. The landlords reckoned without Mary Barbour and the women of Govan. The women were already campaigning against the poor maintenance of their tenements and rent rises up to 23% above pre-war rates the women started a rent strike. The protestors became known as “Mrs Barbour’s Army”. Mary co-ordinated all aspects of the strike and protest movement; committees were formed, cards were printed with the words ‘RENT STRIKE. WE ARE NOT REMOVING.’ and placed in tenement windows and whenever the Bailiff’s Officer appeared to evict a tenant women would stop work and prevent him carrying out the eviction. They would hurl flour bombs and other missiles and it is even said they pulled down the man’s trousers to humiliate him. By the end of 1915 as many as 20,000 tenants were on rent strike and protests were spreading beyond Glasgow. Matters came to a head with the decision to prosecute 18 tenants for non-payment of a rent increase. Thousands marched in what the press described at the time as “remarkable scenes”. The protest was noisy but peaceful but those within the Sheriff Court were sufficiently alarmed at the sheer number of protesters that they phoned Lloyd George, at that time munitions minister in the wartime coalition government. He told them to release the 18 tenants, and assured the Sheriff and protestors that action would be taken to resolve the matter. He was true to his word and less than a month later Parliament acted to pass the Rent Restriction Act, which set rents at pre-war levels. 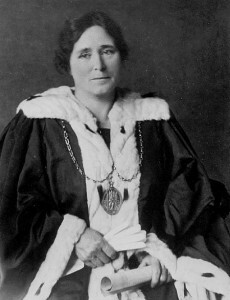 After the war Mary stood as a Labour candidate and was elected to Glasgow Town Council, becoming the one of the city’s first woman councillors. While on the council Mary helped create the first family planning centre, served as Glasgow’s first woman Baillie and was one of Glasgow’s first woman magistrates. She campaigned for free school milk, children’s playgrounds, municipal wash-houses, and an end to slum housing. When she died her obituary in the Govan Press said that “there was never a more revered and loved local leader than she was in the heyday of her active life”. There is a campaign to create a lasting memorial to Mary Barbour and I have made a personal committment to celebrate her contribution. Glasgow Women’s Library are hosting the March of Women to coincide with International Women’s Day, 2015. I will be part of the performance and voicing Mary Barbour. A real honour! Ratta–ratta –tatt! the echo back.